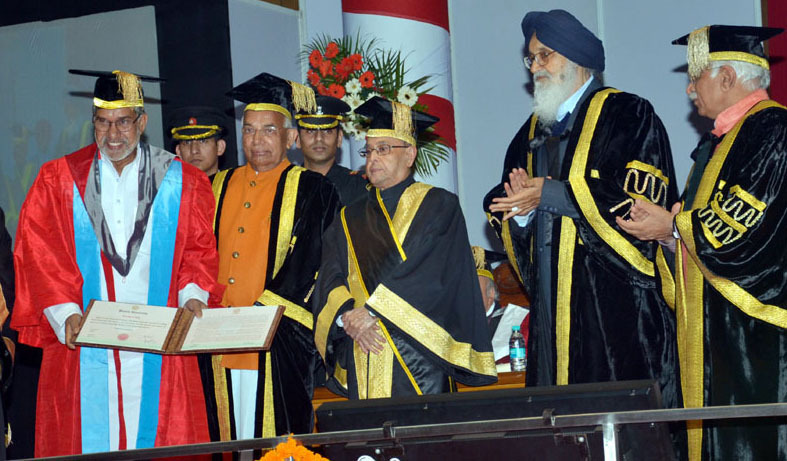 CHANDIGARH, March 14, 2015 : President of India Sh Pranab Mukherjee today presided over and addressed the 64th Convocation of Panjab University (PU), Chandigarh. Medals, Prizes and Degrees to the PU students passing examinations in 2014 were awarded at the Convocation. 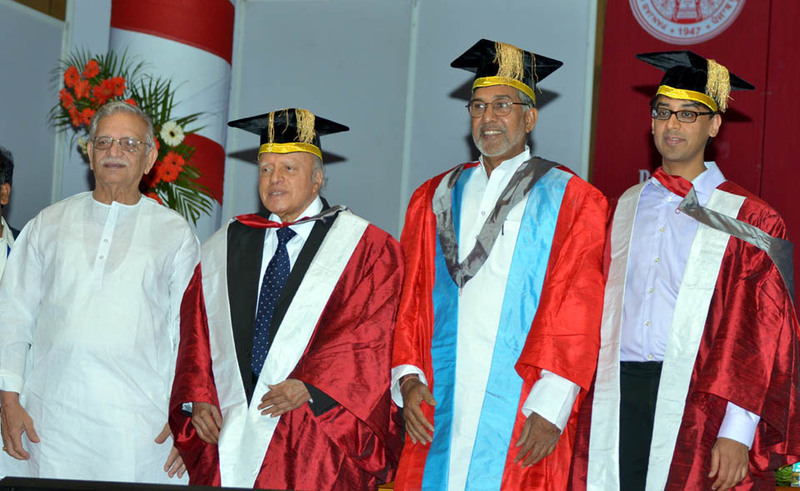 Fields Medal winner (2014) and noted Mathematician Prof Manjul Bhargava and renowned agricultural Scientist and recipient of Padma Vibhushan, Prof M S Swaminathan received PU Honorary Degree from the President of India. Sh Kailash Satyarthi and Prof Manjul Bhargava received Doctor of Laws (Honoris Causa) and Doctor of Science (Honoris Causa) respectively. Noted lyricist and film personality Mr Gulzar was bestowed and Padma Shri Awardee, Dr. Degrees to the 2014 PU students in Doctor of Philosophy (Ph.D), Doctor of Medicine (MD) & Master of Surgery (MS) was awarded at the function. First three candidates in each examination and subjects having obtained first division were also given Degrees at the Awards Function. As many as 682 students received degrees and medals in the prestigious ceremony. 514 of them are females and 168 males. 236 out of total 283 students received Ph.D degrees and 446 out of 520 students received other degrees and medals. Medals, Cash awards and other endowments were given to various 303 toppers of all the 2014 Examinations. Medals and degree to the toppers of all the 2014 Examinations were also given on the occasion by the PU Vice Chancellor. PU Ph.D degree awardees were from 3 other countries and 17 states of India. Seven international students from Iran, two from Iraq and one from Thailand received Ph.D degree. Punjab with 111 Doctorates led the tally of eligible Ph.D degree awardees among the states. Punjab was followed by Chandigarh UT with 50, Himachal Pradesh with 44 and Haryana with 35 students. Out of total 283 Ph.D degrees, 109 were from Science faculty, 14 from Pharma Sciences, 58 from Arts, 30 from Education, 38 from Languages, 7 from Laws, 6 from Engineering and Technology, 13 from Business Management & Commerce and 8 from Design and Fine Arts faculties. 192 of them are girls. Degrees were given for first three candidates of M.Phil, M.E, LL.M., M.Tech, M.Pharma, M.BE, MBA, M.Com, M.F.C, M.Sc (HS), M.Sc, MCA, M.Lib & Inf. Sci, M.Ed, M.PEd, MA, MA(HS), B.Sc(Prof), B.Pharma, B.A(HS) Eco., B.A.LLB (Hons), BA (Hons) Education B.Ed, B.PEd and B.Ed(Special Education in learning disabilities).